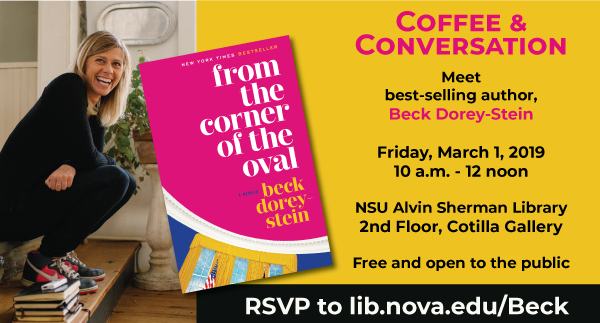 Join us over coffee for a little conversation with award winning author, Beck Dorey-Stein. In 2012, she was just scraping by in DC when a posting on Craigslist landed her, improbably, in the Oval Office as one of Barack Obama’s stenographers. The ultimate DC outsider, she joined the elite team who accompanied the president wherever he went, recorder and mic in hand, eventually traveling to 45 countries around the globe. After leaving her post in 2017, she turned her journal into her first book, From the Corner of the Oval. Get inspired. Free and open to the public. Please RSVP at: lib.nova.edu/Beck. NSU Alvin Sherman Library 2nd Floor, Cotilla Gallery. This is part of the 2019 Literary Feast Authors Series for the Broward Public Library Foundation.